On Thursday, the province will announce the 2016 budget. My hope is that Ontario will make a positive step forward in fighting climate change by putting a price on carbon pollution. Pricing carbon pollution is the best tool we have to combat climate change and promote a prosperous clean economy. That’s why the GPO continues to push the province to implement an effective carbon pricing policy. We support what many economists consider the most effective, fair and efficient carbon pricing policy — carbon fee and dividend. This would be something like BC’s successful carbon tax. 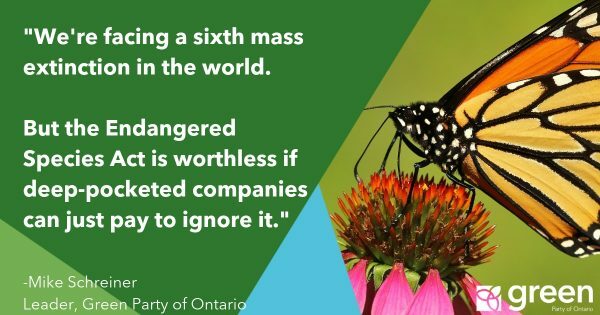 The Ontario Liberals, however, announced last year that they would put forward a cap and trade system and join the carbon trading market pioneered by California and Quebec. Although cap and trade has experienced mixed results in Europe, it can be effective in reducing carbon pollution if implemented without exemptions, free permits and carbon offsets. Quite a few “ifs” to be frank. I think the Liberals chose cap and trade for two reasons: 1) to avoid the word “tax” and 2) to avoid going it alone. The Ontario PC party is going to slam any price on carbon as a “tax on everything,” the NDP would likely have joined the PCs in opposing a carbon tax or fee—as the BC NDP did in opposing the BC carbon tax. Cap and trade seems to present the path of least political resistance. But has Paris opened new possibilities? The Alberta NDP has announced a carbon tax. The federal Liberals are talking about a national price on carbon. Maybe the Ontario Liberals should up their game by announcing a carbon fee and dividend policy moving forward? How do you think the GPO should respond? Should we criticize the Liberals for not adopting carbon fee and dividend, or should we focus on making sure that cap and trade is implemented without lobbyists getting industry exemptions, free permits and lots of carbon offsets?